The Thames Tunnel, built between 1825 and 1843 was the first underwater tunnel in the world. It spans the Thames between Rotherhithe and Wapping in the East End of London and introduced the UK to the Brunel family. The Thames Tunnel – Connecting Wapping and Rotherhithe. The tunnel was conceived by Marc Isambard Brunel, father of Isambard Kingdom Brunel, and both father and son worked on this innovative construction. One of the great advantages of London is the Thames. The river allowed the capital to be one of the most successful ports in the world, and many industries and port sites sprang up on its banks. But, the river also causes London some problems with access. Connecting two ports at opposite sides of the river has always been tricky, especially if they are not located close to bridges and find that water transportation is limiting. By the 1800s, it was obvious that a land-based link between the two banks of the river would be extremely useful. There had been an attempt in the late 1700s and, in the early 1800s, a group of Cornish miners targeted Wapping and Rotherhithe as ideal locations for the entrance/exits of an underground tunnel. This group, however, found it impossible to cope with the soft ground under the Thames and their attempts to dig a tunnel kept flooding and crumbling. By this stage, it looked like an underground passageway just wasn’t feasible. 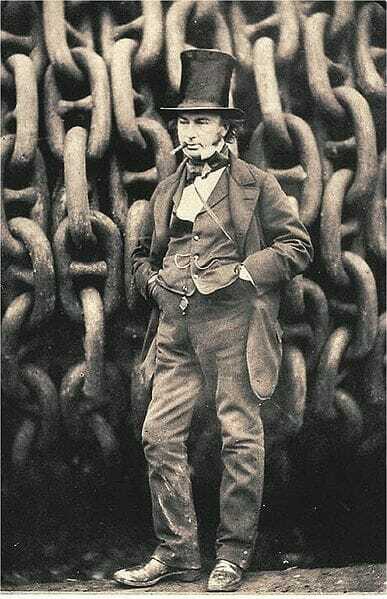 Marc Isambard Brunel refused to admit that a tunnel could not work. He had already put some thought into the process of building an underground tunnel in the early 1800s when he had tried to persuade the Tsar of Russia to build one under the river Neva. Brunel identified the problems that the Cornish failed attempt had brought to light. He developed plans to bypass the problems with the soil by using a tunnelling shield. This device allowed men to move through the tunnel excavating earth. They then shored up their excavations, which were reinforced in turn by men laying bricks behind them. The men were protected against cave-ins, got round the soil problems and the tunnel could be built step-by-step. By 1823, Brunel and his partner, Thomas Cochrane, drew up plans for the tunnel dig. They quickly arranged investment from private financiers, including money from the Duke of Wellington, and set up the Thames Tunnel Company to run the project. Things would not go as smoothly as they hoped. In 1825, Brunel started to dig an entrance shaft at Rotherhithe in South London. Once this was completed, he could start to use the tunnel shield in earnest. Although this was safe way to dig out a tunnel, it was also exceedingly slow. His men could only clear around 10-12 feet a week. The project suffered from financial problems and the directors of The Thames Tunnel Company decided to charge tourists to watch the shield work. Despite the fact that they charged a shilling per visitor and got hundreds of visitors each day, financial constraints shut down the dig in 1828. It took until 1834 for work to start again and Brunel had to take a loan from the Treasury before he could restart. It took another five and a half years before his workers reached the other side of the Thames, and the tunnel was not opened to the public until 1843. The Thames Tunnel took eighteen years to build all in all. It was massively over budget and massively expensive. The conditions for Brunel’s men were also fairly dire. The water that leaked through the roof as they dug through the tunnel contained sewage, which produced methane gas. This made many of them ill, including Isambard Kingdom Brunel himself. The tunnel was also prone to flooding and at least six men died in floods during its construction. What was the Thames Tunnel used for? Once the tunnel opened, it had to recoup some of the money spent on it. It wasn’t wide enough to take vehicles at its entrances and nobody would fund a project to make it wider. It became a pedestrian tunnel with some stalls operating as shops, attracting approximately two million visitors a year, all of whom paid a penny to walk through. The tunnel also developed a bad reputation. Tunnel thieves would hide away in it and rob passers-by and prostitutes used it to ply their trade. By the 1860s, the East London Railway Company agreed to buy the tunnel. They wanted to use it to transport passengers and goods from Wapping to the other side of the river. This company ultimately became part of London Underground who continued to use the tunnel as part of the East London Line until the early 1960s. It is now part of the London Overground network.